On the State: Lectures at the College de France 1989-1992. Pierre Bourdieu. Polity. 2015. 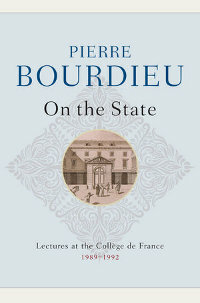 On the State provides an account of Pierre Bourdieu’s lectures on the complex and multi-faceted notion of the state from the early 1990s. Not just a transcription of his words, but a lattice of digressions, notes and personal reflections, these lectures read as the work of someone at the height of their intellectual powers. To summarise the content in a single review is almost meaningless, but the range and diversity of subjects covered (religion, housing, television, the family and dynasty, bureaucracy, economics and more) mean that this is a set of documents from which any social science researcher will be able to draw some use. Yet here, I wish to focus on how Bourdieu analyses the state using his own sociological theory, and how these lectures provide an original document in the practice of pedagogy. Building on the classic definition of Max Weber, that the state is the ‘monopoly of legitimate violence’, Bourdieu starts his exploration and own definition of the state as that which possesses ‘the monopoly of legitimate physical and symbolic violence’ (p.4). This obviously ties to the strong theme within Bourdieu’s sociology that powers and capitals have to be legitimated by dominant actors, and it is the state that ultimately holds the role of legitimator. After quickly establishing this definition, Bourdieu uses his lecture series to explain the how and why, through a litany of historical, political and empirical examples and case studies. These vary from extremely detailed policy analyses, conducted either himself or by his team of researchers, to more anecdotal cultural instances, ranging from the emotional significance of the civic calendar (which sits ‘at the very heart of our personal consciousness’) (p.7), to the French spelling of water lily (and why those who write nénuphar possess state-sanctioned symbolic superiority over those who write nénufar) (p.119-21). The concept of field also plays an important role in Bourdieu’s conceptualisation, with the state seen as a form of supra-field. It is both a field in itself, but more significantly occupies a position in the structure, conditioning and functioning of other fields like universities, literature, religion, and employment. Bourdieu sought to move beyond what he saw as the traditional Marxist conceptualisation of the state’s function (the maintenance of order for the benefit of the dominant) and that of the state as a neutral site where disagreements meet. Instead he poses the idea of the state as constituting ‘the form of collective belief that structures the whole of social life’ (p.381) within temporal and cultural contexts. The state and its commissions act as the guardians of doxa, with the ability to socially construct a position where ‘how things are’ and ‘how they should be’ are the same. To reinforce and reproduce such a position, state institutions have to ‘present the spectre of universality’ in values and logic (p.28). In critiquing in this way, Bourdieu argues for the anti-democratic (and anti-populist) view of the emergence of the state, which sees institutions as growing from an organised population who delegate power to elected representatives. Instead he argues that a certain number of social agents and jurists gradually built up institutions, using them as specific resources which can be deployed to ‘say what is good for the social world’ and to proclaim the official in the form of orders (p.33). The state, he argues, is the product of the agents with the authority to do the state’s work, and not the other way around. How is this symbolic capital operationalised? Bourdieu reaches to a term from Spinoza – obsequium, meaning respect paid to the state or the social order. We may have a uniformly negative understanding of what obsequious means today, but Bourdieu sees obsequiousness in even the most critical and anarchic person’s response to the state, its institutions and its representatives. From the person humbly and fearfully applying for a mortgage (p.13-6) to the teachers and pupils dogmatically following a superior’s timetable (p.171-3), ‘homage is paid not just to an individual who is the apparent object of respect, but to the social order that makes this person respectable’ (p.35). Famously more read-about than read, Bourdieu’s writing style, particularly in his earlier work, has always been a bit of a slog. But those who have seen the documentary film Sociology is a Martial Art will know his public speaking could be very accessible. These edited and developed transcriptions of his lectures really allow his skills as a communicator to come across. Sections which appear irrelevant to his argument do remain, but one of the joys of this collection is the humour (which all lecturers aspire to) and the instances in which Bourdieu finds he has to re-explain himself (which all lecturers know). Several lectures start with him answering questions arising from previous sessions, showing the non-linear nature of teaching. There is an excellent section where Bourdieu doubles-back on himself, expressing disappointment that students failed to take enough notes during a vital section of a previous lecture. He gently chastises himself, expressing ‘I might put this down to the quality of my performance…[but this] part was the more important, the more worthy of being noted’ (p.23). As a reader, I found I, like his students, had drifted off during this same section. Therefore, to find Bourdieu chastising me, the reader, for not paying enough attention to the right bits, and criticising himself for not communicating the importance of his words effectively, provided a highly original and rather meta reading experience. Therefore a rather surprising bonus of this book is that it reads as a lived piece of learning and teaching. It is an excellent resource for anyone interested in the archaeology of pedagogy, or anyone who wants to understand the role of the academic professional in producing educational content. It offers an insight into the construction of academic knowledge, the relationship between the well-structured architecture of scripted lectures, and the more randomly inspired metaphors or anecdotes which make up the process of learning. It is not an overly polished manuscript, and is the better for it.